2013 has been a record-breaking year for diamond auctions globally. From the fancy intense pink Princie Diamond that sold for $39million in April, to the internally flawless, D colour Golcondo Diamond that sold for $10million in December, groundbreaking prices were paid for the rarest and finest diamonds on offer. Here are the most expensive diamonds sold at auction in 2013. 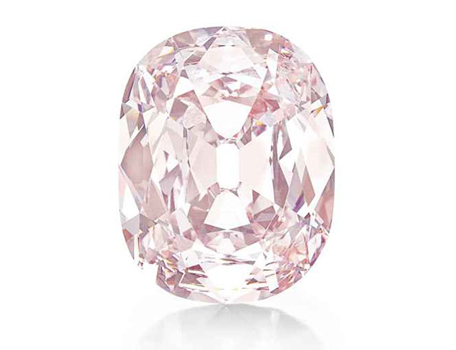 The 59.6ct Pink Star diamond (previously known as “The Steinmetz Pink”) sold for a record-breaking $83.2million (R843million) at Sotheby’s Geneva Magnificent Jewels auction on 13 November 2013. It now holds the record for the most valuable diamond ever to be offered at an auction. 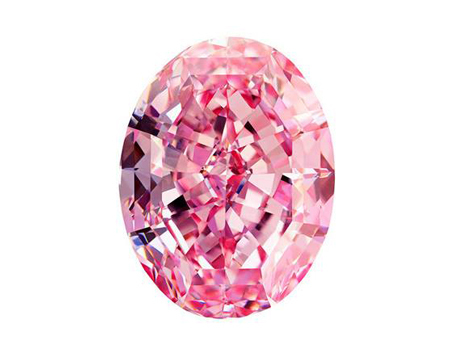 This internally flawless, oval cut natural fancy vivid pink diamond was cut from a 132ct rough diamond that was unearthed 12 years ago (weighing 132 carats in its rough form) and took two years to cut the diamond to perfection. This 34.65ct cushion-cut natural fancy intense pink diamond is believed to be the third largest pink diamond in the world and was discovered 300 years ago in the Golconda mines in southern India. It once belonged to the royal family of Hyderabad, who ruled one of the wealthiest areas of Mughal India. It had not been seen in public since 1960 when Sotheby’s sold it as the “property of a gentleman”. The Princie diamond was auctioned by Christie’s in New York on 16 April 2013 and purchased by an anonymous collector bidding by phone. 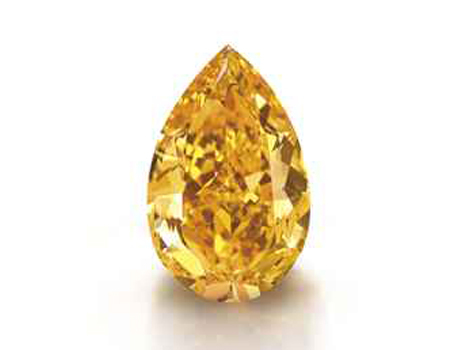 The largest fancy vivid orange diamond, known as The Orange, was expected to fetch a mere $21million, but ended up selling for $36million (R372m) at Christie’s Geneva Magnificent Jewels Sale in Geneva on 12 November 2013. This 14.82ct pear-shaped diamond broke two world records: the price per carat for any fancy colour diamond at auction, and the price for a fancy-vivid orange diamond. The orange colour is the result of the presence of nitrogen during the diamond’s creation. Among the very few fancy vivid orange diamonds that were ever sold at auction, the largest was the “Pumpkin Diamond” at 5.54 carats. The Orange diamond is more than double that size. The Magnificent Oval, a 118.28ct white oval diamond broke a world record when it fetched more than $30million at Sotheby’s auction in Hong Kong on 7 October 2013, making it the most expensive white diamond sold at auction. Discovered in a mine in an undisclosed southern African country in 2011, it weighed 299ct in its rough form before being cut. The diamond, described by Sotheby’s as “the largest D colour flawless diamond”, has been given the highest quality rating awarded by the Gemological Institute of America. A 101.73ct D pear-shaped flawless white diamond fetched $26.7million at Christie’s Magnificent Jewels sale in Geneva on 15 May 2013. 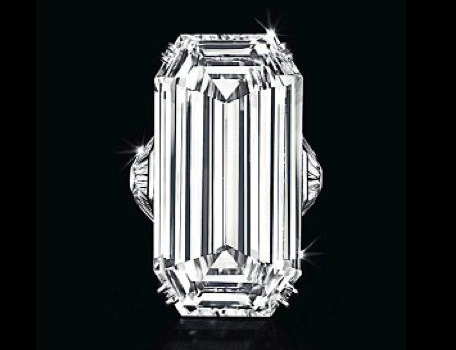 It was purchased by Harry Winston and will be named the “Winston Legacy”. Prior to the sale it was simply known as the “101”. The diamond was discovered relatively recently in De Beers’ Jwaneng mine and weighed 236ct rough that took 27 months to cut and polish. 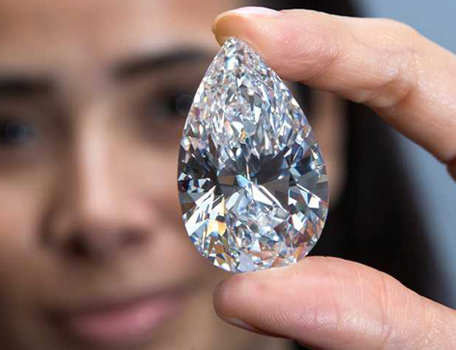 The world’s largest and most perfect briolette diamond, The Star of China, sold for $11.15million at Christie’s Magnificent Jewels sale in Hong Kong on 28 May 2013. 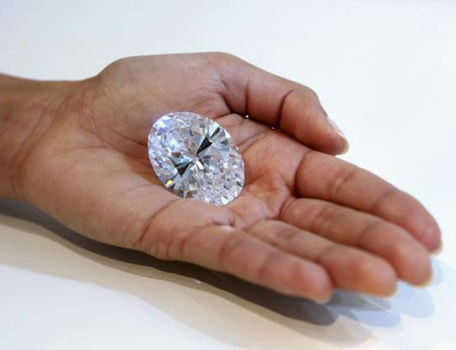 It set a world record for a briolette diamond sold at auction. Tiffany Chen has revealed to be the owner of the 75.36ct diamond, which she named after her company, “The Star of China”. 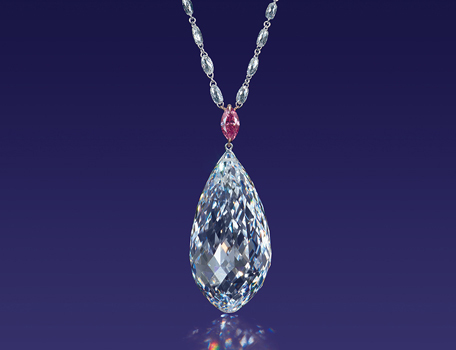 The diamond is part of a pendant necklace that includes a marquise-cut purplish pink diamond suspended above the briolette. The 52.58ct D-colour, internally flawless Golconda diamond sold for $10million at Christie’s Magnificent Jewels auction in New York on 10 December 2013. Diamonds from the ancient Golconda mines in India are known for their type, colour and degree of transparency that is rarely duplicated. They have produced some of history’s most famous diamonds, including The Hope, the Koh-i-Noor and the Regent Diamond. These record-breaking diamond auctions show us just how big the demand for investment diamonds is becoming. “In the last three to five years there is a very strong interest in investment banking to invest surplus cash in diamonds as a hard asset investment. This is a very attractive investment as it’s very condensed and continues to appreciate over time,” said Yair Shimansky, CEO of Shimansky, in a recent TV interview with Lindsay Williams for CNBC Africa’s “Captains of Industry.” Watch the two part TV interview here.